Just chillin with the neighbor's dog, Yuki. First off I want to apologize for all the posts I am making this week. I have a backlog of projects and will probably be bombarding your feed over the next five days. Sorry, guys! Now can we please talk about the Colette Patterns Mabel skirt aka my new TNT summer skirt pattern of 2014 which is going to be made 34857602345 times in the next few months? When I set my eyes on this beautifully drafted skirt it was love at first sight. Which was good considering I pre-ordered it without knowing what it was. This is totally embarrassing, but I want to share a story with you all. In high school I won the Homecoming thing at my high school. Weird, right? Three different outfits were required for the various functions and I still wear the knit knee length leopard print skirt that I bought for the school assembly. It's lasted close to fifteen years, so yeah, I was pretty pumped that Colette Patterns came out with a pattern that was similar, so I could make more knit skirts. My pup wanted in on this shot. Mabel is the PERFECT first project for someone that is new to sewing knits. There are not many pieces to cut out, the construction is very straightforward, the directions are crystal clear in the usual Colette style, and it can be sewn with a serger or sewing machine. The fabric requirements are around one yard, so it's perfect for splurging on a nice knit. Yes, you read that right, one yard. Oh yeah, sorry for the disheveled look. It's been in the nineties here (gross) and this top is pilling and wasn't the greatest choice to pair with the skirt, but whatevs, it was hot and it was more about comfort and feeling cool than being stylish. My husband calls this my "realtor shot" since it's taken in front of houses haha. I'm calling this skirt my wearable muslin, although most people probably have skipped the muslin for Mabel. The only reason I made one was because of a Project Sewn fabric issue. I needed two yards of a sweater knit (for the project you are going to see on Tuesday), but after placing the order I found out that Hart's only had one. The fabric was too cute, I couldn't pass on it, and figured I'd use it for a future project. Sweater knits are not one of the recommended fabrics for Mabel, but I figured I'd give it a shot and call it a wearable muslin. The waistband is definitely not as tight as it should be, but it's wearable and most importantly, comfortable. A one yard skirt - perfect! And I love the print. 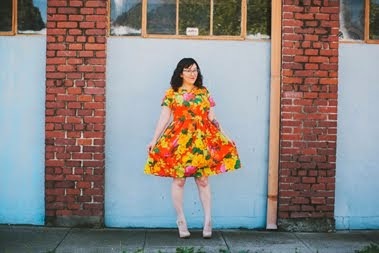 The Mabel is super cute on you and I love your fabric choice. Beautiful! I love this whole outfit! Ooooh! I love the fact that this is a 1 yard project! How practical! I love the entire ensemble! I am so happy you used a leopard print - it's really your signature, no? You look great! This looks great! I've got a Mabel planned as well. I too ordered it without even knowing what it was! Also, can't wait to see what you've got for project sewn tomorrow! Wow one yard! More of a reason for me to get on it!! I have this pattern and don't have a clue as to why it's still in the envelope. I've read it only takes about an hour too! The leopard is super cute! Also, OF COURSE you were the homecoming queen! You're completely awesome! Erin, your Mabel looks so dang awesome on you! Sweater knits should be in the suggested fabrics, because I definitely want a cozy sweater Mabel now. You know, in November, when it's no longer a million degrees! Love, love, love this. Love your Mabel!! It's a good dress-up or dress-down skirt. This is so adorable! I'm really weary about wearing a knit skirt and it being too tight or something, but I may have to give this skirt a try. Thanks for sharing! we are wholesaler of namebrand clothes, shoes, bags, sunglasses and watches. please check our products pictures and price in http://www.priceinsider.net .